A couple of Saturdays ago was a day I'd been excited about for a very long time as it was the day of the #NWbloggersmeetup which was organised by the lovely Sammy from Little Fickle. 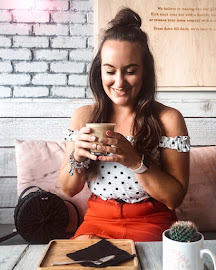 I was extremely excited to catch up with some of the girls who I had met previously at The Liverpool Body Shop Event and to meet some more Liverpool bloggers who I had been chatting to online. I started the day by meeting a couple of the girls in Central Perk for a quick coffee and toastie before heading a little bit out of the centre of town to the venue. The event was held at Kabinett, a wicked underground bar with amazing cocktails and a cosy atmosphere with sofas and fairy lights galore. There were two brands in attendance, Natalie Roche and Junkbox Couture. Natalie Roche are the UK distributors for brands GlamGlow, Xen-Tan and Amazing Cosmetics which is a fairly new brand selling concealer than Rosie Huntington-Whitely herself raves about. If it's good enough for her than it's good enough for me! Lucy from Natalie Roche was so lovely as she talked us through all the products and letting us test all the masks from GlamGlow. She had prepared some goodie bags for us which included testers of the GlamGlow Power Mud dual cleanse treatment mask, the Amazing Cosmetics concealer in various colours and a couple of mini Xen-Tan which I am extremely excited to try out! Next I spoke to Carrie from Junkbox Couture who sells handmade printed t-shirts, mugs, wooly hats, framed prints and more. I loved all of these items especially the frames which Carrie actually uses her own photography for - an amazing idea! Junkbox Couture is based in Chester but will be available on ASOS very soon and I highly recommend checking them out! I opted for a Cosmo whilst Emma went for a Raspberry Mojito - they were delish and went down a little too quickly! I loved every second of the #NWbloggersmeetup and it was lovely to meet fellow bloggers from the NorthWest especially Hannah and Sophie and talk about all things bloggy! I already can't wait for the next one!